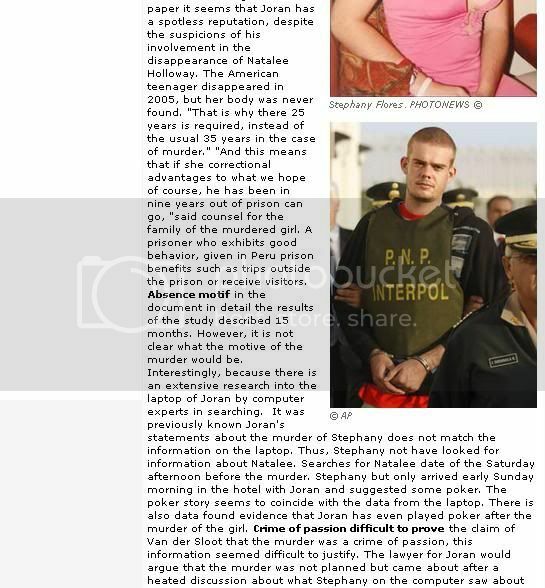 Defense Stephany Flores: "Indictment is weak and favors Van der Sloot"
Sunday September 4, 2011 - 9:41 a.m.
After almost a year and three months of the crime of Stephany Flores Ramirez, prosecutors presented on Friday August 26 the judiciary charges against Joran Van der Sloot, the confessed murderer of 22 year old. However, according to the defense of the family of the university, the complaint by Miriam Castellares Riveros, head of the Prosecutor's Office Ninth Criminal Court, is "weak" and "favors" to the Dutch citizen. Riveros Castellares requested in his indictment, which had access elcomercio.pe, Van der Sloot received a sentence of 30 years in prison for crimes against life, body and health as a form of murder, and against equity for simple theft to the detriment of Flores Ramirez. 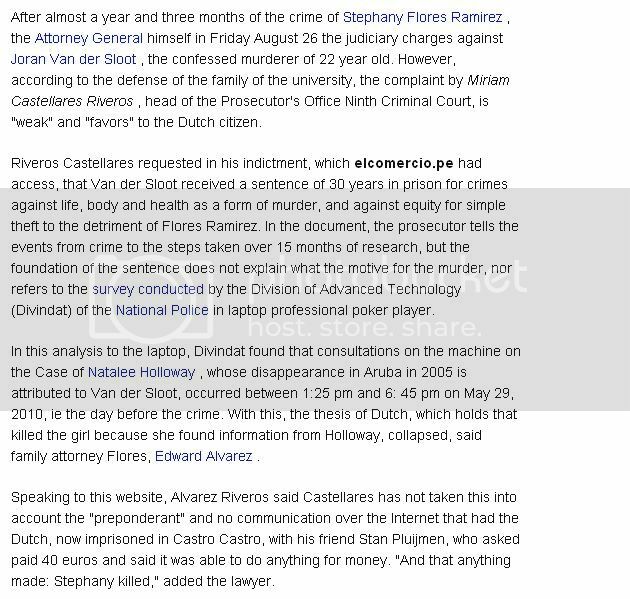 In the document, the prosecutor tells the events from crime to the steps taken over 15 months of research, but the foundation of the sentence does not explain what the motive for the murder, nor refers to the audit by the Division of Advanced Technology (Divindat) of the National Police in the laptop of a professional poker player. In this analysis to the laptop, Divindat found that consultations on the machine on the Case of Natalee Holloway, whose disappearance in Aruba in 2005 is attributed to Van der Sloot, occurred between 1:25 pm and 6:45 p.m. of May 29, 2010, ie the day before the crime. With this, the thesis of Dutch, which holds that killed the girl because she found information from Holloway, collapsed, said family attorney Flores, Edward Alvarez. 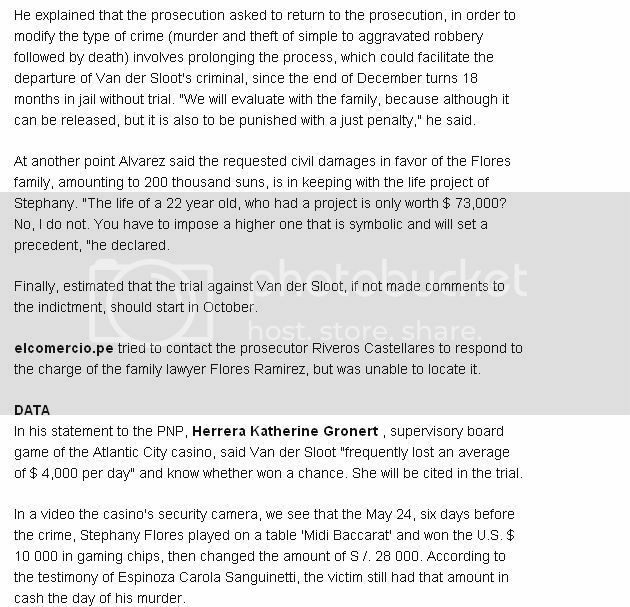 Speaking to this website, Alvarez Riveros said Castellares has not taken this into account the "preponderant" and no communication over the Internet that had the Dutch, now imprisoned in Castro Castro, with his friend Stan Pluijmen, who asked paid 40 euros and said it was able to do anything for money. "And that anything made: Stephany killed," added the lawyer. 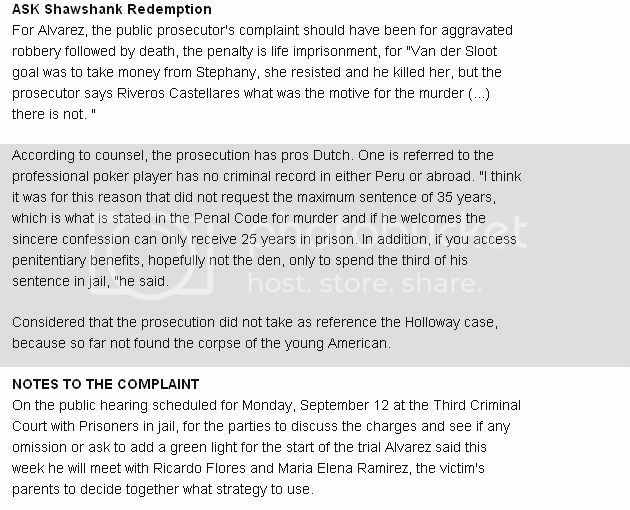 For Alvarez, the public prosecutor's complaint should have been for aggravated robbery followed by death, the penalty is life imprisonment, for "Van der Sloot goal was to take money from Stephany, she resisted and he killed her, but the Riveros fiscal Castellares say what was the motive for the murder (...) there is not. " I can do translated screen shots if that would help? It might take a little while, my internet has been very slow today. But I'll post them asap! CBS/AP) LIMA, Peru - A study of Joran van der Sloot's laptop shows he is lying when he says he killed a young Peruvian woman in a fit of rage after she discovered his connection to Natalee Holloway's disappearance while using the computer, a senior Peruvian police official said Friday. Stephany Flores did not view any such information on the laptop after accompanying Van der Sloot to the Lima hotel room where she was killed on May 30, the technology chief of Peru's police, Col. Oscar Gonzales, told The Associated Press. "She didn't view anything about Holloway. It's a lie that she tried to ask him about (the case)," Gonzales said. ... Now Van der Sloot, the Dutch Sporter is lying to save his bacon in Peru in the death of Stephany Flores. 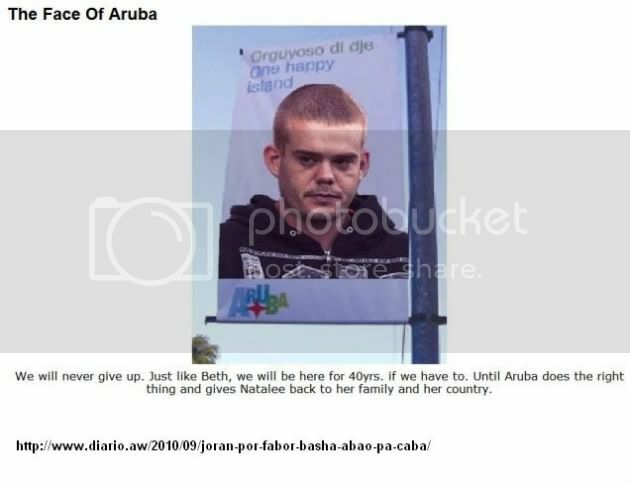 Van der Sloot has claims that he murdered Flores in a fit of passion and rage after discovering that she had violated his privacy and has looking up information on his laptop in connection with the death of Natalee Holloway in Aruba. Joran van der Sloot may have spent the night playing online poker after murdering Stephany Flores, according to Peruvian forensic investigators who have carried out a detailed examination of his laptop. The detectives also found that Flores did not search for information on Natalee Holloway immediately before the murder, as Van der Sloot claims. The laptop was used to search for details of the Holloway case, but much earlier in the day, Dutch website Crimesite reports. Van der Sloot says he killed Flores in a fury when he saw she was reading about his alleged involvement in Holloway’s disappearance. Between 04.24 and 08.23 Van der Sloot’s laptop was in use, with a number of pauses, and two poker websites were visited. 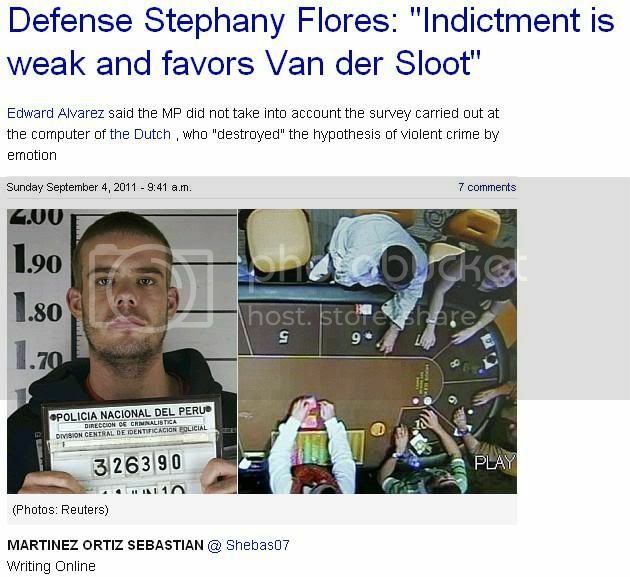 This could suggest Van der Sloot went on playing poker after murdering Flores. Another possibility is that the murder took place after the poker games were finished. This would mean the killing did not take place during a row shortly after the two returned to the hotel at 05.30, as he claimed in his initial statement to the police. 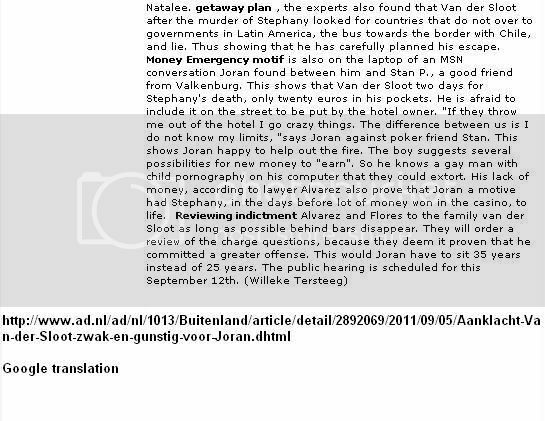 Van der Sloot says that after an evening at the casino he and Flores returned to the hotel at her suggestion to go on playing poker. When he checked his e-mail he found hate mail relating to his alleged involvement in the disappearance of Natalee Holloway, he says. When he returned to the room after fetching coffee, he claims he found Flores using his laptop to look for information on the Holloway case, and lost his temper. Van der Sloot’s defence lawyer argues he killed Flores in the heat of the moment when the row turned into a physical fight. The murder was therefore not premeditated but a ‘crime of passion’. But the data on the laptop shows the search for information on Holloway, said to have prompted the row, took place much earlier in the day, during the afternoon. I can't believe what is happening with the case in Peru and Joran. He might go free in 9 years! 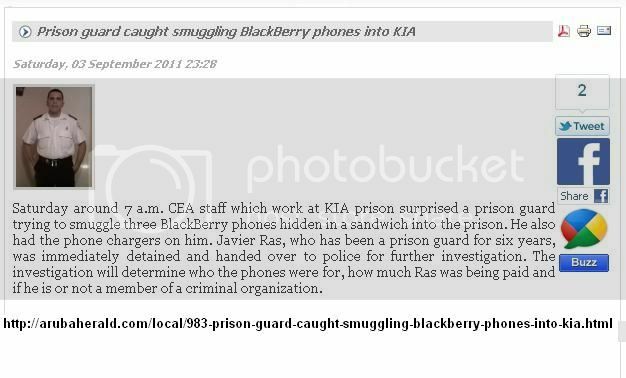 KIA guard caught by CEA personnel bringing in two Blackberry's and a charger hidden in his sandwich (s)? publication: monday, 5 september 2011.
oranjestad(aan): saturday morning alrededor of 7or the personal attentive of cea stop at door of kia owing to sorprende (catch) one cuidado of preso (prisoner guard) cu 2 blackberry good scondi in his sandwich. separa of the apparatus for comunica, the was have the chargernan also. is deal here of the ambtenaar javier ras cu have some year end trahando in institute coreccional aruba y cu owing to stay deteni at once y entrega at police for more investigacion. the asunto here is very earnest y for of enough year end was have atencion of esunnan responsible for cuida the institute. the problem is cu everybody know cu is the same cuidadonan of preso (guard of prisoner) is trece blackberry eyden y sell cu the presonan (prisoners). but the problem is cu for garanan is dificil. majority trip is hinca the celular in one saco of plastic y sconde this in cuminda of the trahado, tapa below ; rice y sauce. for her personal of cea is dificil y even contra ley for exigi of the personal of kia for they touch in his cuminda buscando articulonan prohibi. one solucion will is for prohibi the empleadonan for come trabao cu cuminda but esey will nifica the hour cu is kia self will have to percura for cuminda for his empleadonan. without doubt the will pisa on the presupuesto of the institute. one another solucion, esun more factibel, is for instala one apparatus for blokia sign of celular in the institute. in pasado owing to arrive of hacie but the apparatus was blokia one area mucho big, consecuentemente the was stroba the bisiñanan also of ricibi or haci call via celular. is think cu have to have one apparatus in cual is blokia the sign of celular in one area more diminutive. so is evita the asunto of enter cu celular in form ilegal in jail. saturday morning at once owing to cuminsa two trayecto at instant of grab javier ras cu celular model blackberry scondi in his bread. the first is the trayecto disciplinario, in cual owing to prohibi his entrance in kia can will soon already so can realisa one investigacion inner on the asunto here. 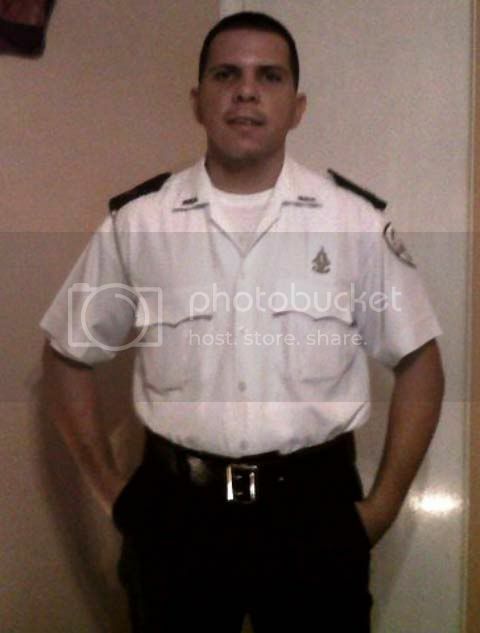 the another trayectoria cu is march simultaneamente is esun penal, cu police y landsrecherche will haci for so determina for that the owing to bay take away the celularnan here, cuanto they're page for her trabao ey y if the is form part kizas of one organizacion criminal. cu the detencion of saturday morning have to bay one sign cla for her personal of kia y cea, cu have to come one reorganizacion y re evaluacion of all the personal. minister mr. drs. arthur dowers will have to cuminsa think in “screen” all the personal, of director till downstairs, for sigura cu esunnan cu is work eyden is empleadonan integro, intachable y capas for accomplish cu they funcion. de will contrario will have to busca one another handicraft in gobierno. "He is described as a professional poker player with no criminal record in Peru or abroad. That is to his advantage. " 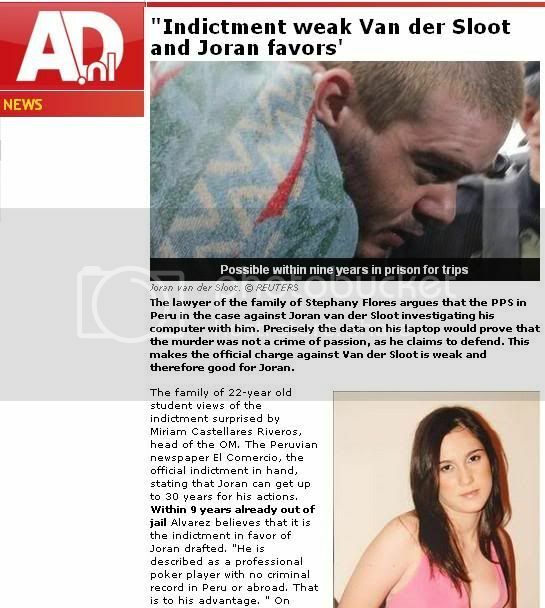 On paper it seems that Joran has a spotless reputation, despite the suspicions of his involvement in the disappearance of Natalee Holloway. The American teenager disappeared in 2005, but her body was never found. "That is why there 25 years is required, instead of the usual 35 years in the case of murder." "And this means that if she correctional advantages to what we hope of course, he has been in nine years out of prison can go, "said counsel for the family of the murdered girl. CNN has learned a suspect has confessed to killing Natalee Holloway. The American teen vanished in Aruba nearly two weeks ago. We'll have a live report from Aruba in just a few minutes. NGUYEN: Up first this hour, CNN has learned that one of three suspects in the Natalee Holloway disappearance has confessed to killing her. Holloway was last seen in Aruba May 30. That's when her high school classmates say she left a bar with three men, all of whom are now in police custody. CNN's Karl Penhaul joins us now from Aruba with the latest on this investigation. So is this the break that everyone was hoping for? KARL PENHAUL, CNN CORRESPONDENT: It would seem so, Betty, although police at this stage are playing their cards very close to their chest because of the extreme sensitivity of this case for the island. But shortly before midnight, a senior police officer told CNN that one of the three suspects detained on Thursday had made a confession to the killing of Natalee Holloway. He didn't say which of the three suspects had made that confession. You'll remember that on Thursday three young men, one 17 years old and two brothers aged 18 and 21, were arrested by police. And their homes were searched, a car was taken away as evidence, along with computer equipment and some other items. Now, the prime minister of the island has said that he, so far, has not been informed of any confession. At the same time, he says that those able to make statements about this issue are those directly carrying out the investigations. As part of the separation of political powers here, the prime minister, although broadly kept up to date with the pace of investigations, would not be kept up with minute-by-minute developments, as he has told us -- Betty. NGUYEN: Karl, while no one wanted to hear this, people were interested in hoping to find some clue as to what indeed had happened. As you say, there has been a break in this case, but not what the parents of Natalee Holloway wanted to hear. Have you spoken with them? How are they reacting to this confession? PENHAUL: No, we haven't been able to speak to Natalee's family at the moment, Betty. They have been staying here in the Holiday Inn, the same hotel where Natalee had been staying during her stay in Aruba. We've seen them make a brief foray through the lobby of the hotel. That was late last night. Since then we haven't seen them to ask them about this latest news -- Betty. NGUYEN: And what about the search for Natalee? Now that we have this confession, any indication as to whether this will lead to a search to find Natalee or her remains? PENHAUL: There had been suggestions even as early as last night a search could get under way to look for possible remains of Natalee Holloway. The prime minister and also police officials then said that the search would not take place last night, but they did say that in the early morning, investigators would continue doing their job. They said that included the question of searching for further evidence, including possible remains -- Betty. NGUYEN: Now, does that cause a question in your mind? Because we have a confession, but now you're saying there's no search in any particular area. Is that because maybe this confession doesn't detail where Natalee may be? PENHAUL: We have no further details of the confession, the detail of the confession or the depth of the confession. 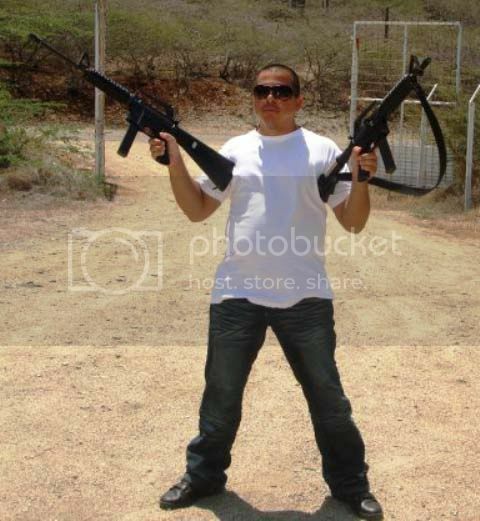 One must remember that Aruba's police force, while they pursue this investigation very thoroughly, very enthusiastically, it is, nevertheless, a small police force, and we don't know if they are equipped to carry out this type of search during nighttime hours. And that could be a reason why up until now most search operations here on the island during Natalee's disappearance have been conducted during daytime hours -- Betty. NGUYEN: CNN's Karl Penhaul in Aruba on the latest on this investigation. Thank you, Karl. Well, the news this morning of a confession came as friends and family from Holloway's hometown offered prayers of hope. In Mountain Brook, Alabama, they gathered for a prayer vigil at a church after midnight. Well-wishers used a candle to light up a wall adorned with messages to the missing teen. 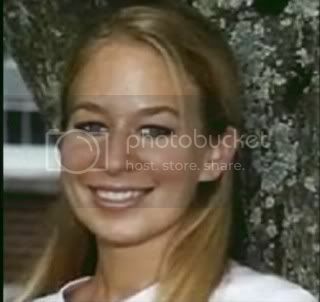 Natalee Holloway, 18, vanished on May 30 while on a trip to Aruba with classmates celebrating her high school graduation. ORANJESTAD, Aruba — One of the young men detained in the disappearance of an Alabama honors student admitted "something bad happened" to the woman after they took her to the beach, a police officer said, while prosecutors said today the investigation was at a crucial point. Police refused this morning to say whether they discovered anything overnight to solve the mystery of what happened to Holloway, who was last seen in the early hours of May 30. Referring to Dompig's statement, prosecution spokeswoman Vivian van der Biezen said today: "We neither confirm nor deny any information coming from other sources ... (about) alleged statements of suspects in this case." Police investigating Holloway's disappearance arrested a man at dawn today but later said he had nothing to do with the case. I agree the outcome of the Sept 12th hearing should be interesting. And regardless of what happens in Peru, Joran still has an indictment in the Alabama courts to answer to. But before that happens, he should pay for the brutal murder of Stephany Flores in Peru to the full extent of the law. If he only ends up serving nine years, that is not justice...imo. Page 58: Detective Jacobs asks us to come to the police station in Bubali in about an hour to give our official statements. Detective Jacobs is sitting behind the counter in a reclining swivel office chair. As we move toward him, he leans back in his chair. “We’re ready to give our statements,” we say, anxious to tell him the facts about Natalee’s disappearance we’ve gathered thus far, so that an investigation can get under way. Page 60: He pushes one hand and then the other down and across his belly, which is extended by his rearing back. He says, “I’ll have to eat my frosted flakes first,” and then, running a hand across his jaw, adds, “and get a shave before I can deal with you.” And with that he gets up from the chair, exits through the little swinging door, and disappears …. A half hour passes. Then an hour. I wish there was an American law enforcement contact here to help us, someone to act as a liaison. I get up from the plastic chair, go outside, and sit down in the gravel driveway …. After almost three hours detective Jacobs comes back into the waiting area and tells me he doesn’t need me today. Bad things happen everywhere. But the difference we need to consider when something bad happens outside the country is the help available for the victims and their families. When we leave these borders, we leave behind all the privileges and rights we're all accustomed to and often take for granted. We have expectations that there will be a safety net of law-abiding official, no matter where we travel, or that our US embassy will come to our rescue. But that's terribly naive. "What I can do is hopefully share some life lessons and prevent this tragedy from happening to another family. So I stay focused on what I can do rather than what I can’t. I can’t get justice for Natalee". By her own account Beth lived a quiet, somewhat uneventful life as a speech pathologist (B.S., M.S.P.) for children with special needs for 24 years. Her life changed quite dramatically in the summer of 2005 when her daughter Natalee disappeared on the last night of her senior high graduation trip to Aruba. this tragic story became the leading news mystery when it happened, and continues to make headlines today. Beth has appeared on every television network in the nation as well as on International TV ,radio, and newspapers, capturing the world's attention as she searched for her daughter. Please R.S.V.P. through Mike Backus at (912) 764-9696 or via email at mbackus@bgcbuolloch.org. All proceeds benefit the Boys & Girls Clubs of Bulloch County. 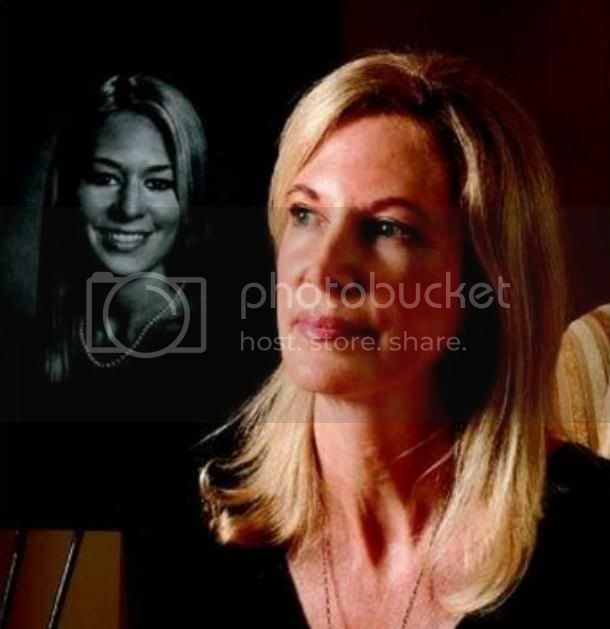 Ogeechee Technical College and ERA Landmark Realty are hosting a Meet and Greet on Thursday, September 8 with Beth Holloway, mother of Natalee Holloway. The buffet style luncheon will be held at the Holiday Inn of Statesboro from 11:45 a.m. until 1:00 p.m. Tickets are available for purchase, but seating is limited. The cost is $30. The Boys and Girls Club of Bulloch County will then hold the 6th annual Steak & Burger Dinner that evening. Keynote speaker Beth Holloway will deliver her message of hope, faith, and perseverance. Reserve your seat for $100 or a table of six for $750. Please R.S.V.P. through Mike Backus at (912) 764-9696 or via email at mbackus@bgcbuolloch.org. All proceeds benefit the Boys & Girls Clubs of Bulloch County.